Is your handyman business covered? Small contracting and repair jobs can be a great way to augment your income, and it can also be a lucrative business–just don’t ignore the need for handyman insurance, no matter what the level or scope of work. It may seem like overkill, buying an insurance policy if you’re only doing “odd jobs”, but entering homes and places of businesses puts you at risk, and any money saved by not insuring yourself against exposures could be dwarfed by court costs and/or damages if something goes wrong. Things happen. An accident can occur anywhere, and happen to anyone. (That is, as they say, why they’re called accidents.) Even if nothing is directly caused by your actions, you may be called to prove that in a court of law, and having the ability to cover the costs of doing so (through handyman insurance) could be invaluable. A handyman insurance policy can be as minimal or robust as you need it to be, and if you need to increase coverage as your business grows, you have that option. What type of work are you doing? This can be a challenge because the very nature of the term “odd jobs” means that you do what’s necessary–you may not know ahead of time what a customer needs. Think of it in terms of what you won’t do. The question is meant to assess risk. Will you be doing things like roofing? Handyman insurance is meant to cover minor jobs, not exhaustive contracting. How much do you make in a year? Or expect to make? Your insurance professional isn’t being nosy; annual income is key in determining your quote for handyman insurance. Your physical location, years of experience, and whether you have employees or not are also things that might be asked. Again, these are all factors in pricing, and figure in to giving you a quote for handyman insurance that’s geared to your individual business. Risk management is an art, and our business is helping you protect your business–and a business is what you have, no matter how small your scale of operations. Call us today at 1-877-907-5267 to get your quick, free quote for handyman insurance, or click here to start the process. Make sure your landscaping business is properly insured. 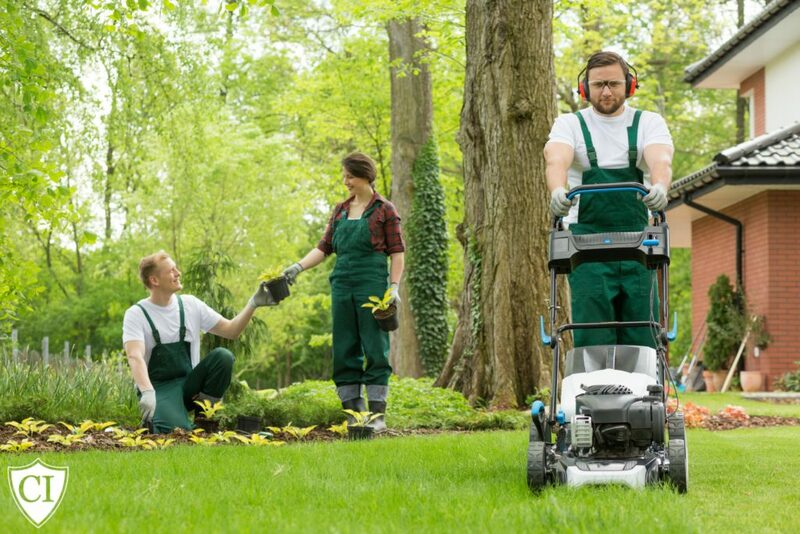 Summer can be a great time for a landscaping or lawn care business, and that also means it’s an important season for reviewing the insurance coverage for your lawn care or landscaping business. Whether you’re just starting a new venture, or your existing landscaping or lawn care business is kicking into high gear, understanding your risks and what the proper coverages are for protecting your assets is key in assisting your success. An important second step would be keeping your lawn care or landscaping insurance commensurate with your growth; new opportunities are exciting, and you may be tempted to think that if you have the time, tools, and manpower, you’re ready for expansion…but covering your risks before an event happens is what keeps your business functioning in case of a claim against you. Don’t let your insurance lapse or lag behind your operations. Speaking with an experienced insurance professional who understands your business’s needs is crucial, and it’s also imperative that you answer any questions–truthfully–about what you do or don’t do in your lawn care or landscaping business, so that your insurance can truly protect you. Having a working knowledge of some types of insurance policies that are commonly needed in landscaping or lawn care businesses might help you understand your insurance agent’s questions, and may also assist you in taking a proactive role in guiding your business’s future. General Liability. This policy protects you in case of an event that could cause a third party injuries or damages. The most basic landscaping or lawn care insurance policy should contain General Liability. Property Insurance. Your building (if you have one), your business equipment–these need to be protected, and included in your landscaping or lawn care insurance. Inland Marine. An endorsement to your landscaping or lawn care insurance that covers the tools that make your business possible. This coverage can be crucial to keeping your business going in case they’re damaged or stolen. Workers Compensation. You need to understand your obligations towards employees, even if your only worker is a friend who helps you part time. Familiarize yourself with your state’s requirements and make sure your landscaping or lawn care insurance is providing what you need in this area. Risk management is an art, and our business is helping you protect your business–right now, and as it grows. Call us today at 1-877-907-5267 to speak with one of our specialists about your lawn care or landscaping insurance, or click here to start the process of a quick, free, competitive quote. At CommercialInsurance.NET, we can assist you with obtaining general liability coverage for a variety of small businesses, including handyman insurance. Whether you own a janitorial or lawn care business, act as a general contractor, artisan tradesman, or landscaper, we can find policies to fit your needs, even if your business seems to change from day to day, as it often does for the jack-of-all-trades who works as a “handyman”. On a daily basis at CommercialInsurance.NET, we encounter people looking to supplement their income by taking on small projects. Whether you are just repairing a screen door as a handyman, or completely remodeling a kitchen and bathroom as a general contractor, if you are entering someone’s home or place of business, you need a commercial general liability policy. There are several reasons why insurance for a handyman is important. No matter how small the project is, you are putting yourself at risk simply by being in someone’s home or on someone’s business property. For instance, the smallest caulking job can cause thousands of dollars worth of damage due to water leaks if done incorrectly. A fallen broom or tool can easily become a bodily injury hazard. Handyman insurance is a way to manage these risks. One response to this may be, “I’m always careful. I’ll never have a claim due to a mistake.” While this may be true, your handyman insurance doesn’t just protect you from your own errors, it protects you when someone blames you for property damage. For example, let’s say you’re repairing someone’s gutter after a storm, and before you leave your customer asks if you can tear off and repair some loose shingles on the roof. Because your handyman insurance does not cover roofing operations, you inform your customer that roofing repair needs to be done by a roofer insured for those operations, and leave. Several months later, you find out you are being sued because of water damage due to that customers’ leaky roof. Of course you will win in court because you always have a contract signed by the customer specifying the work you have completed, but wouldn’t you like to have a handyman insurance policy that will take care of those unnecessary court fees and attorney costs? One of the most common questions we get from new customers is, “What information do I need to provide for a handyman insurance quote? Can I just get a price?” Even though your handyman service may consist of nothing more than a few small repairs a month, your general liability coverage is based on your location (every general liability policy has a physical location associated with it), estimate of gross receipts, and whether you have any partners, employees, or independent subcontractors working with you. Your agent will also have to confirm the answers for certain questions to confirm your eligibility. These questions usually reference operations like roofing, licensed trades, or work on high-risk properties such as medical facilities, schools, or very large mansions or estates. The process takes just a few minutes of your time, but it might be one of the most important investments you make in your business. Call one of our specialists today at 1-877-907-5267 to get your same day quote for a handyman insurance policy. Property Insurance covers you if the property you use in your business is lost or damaged by common perils such as fire or theft. Property insurance covers not just a building or structure, but also what insurers call business personal property, like furnishings. Liability Insurance covers you in the event that someone claims your business caused them harm. Your liability insurance pays damages to third parties resulting from bodily injury or property damage for which your business is legally liable, up to the policy limits, as well as legal fees associated with the claim. It also covers any medical bills for any people injured by your business. Commercial Vehicle Insurance provides coverage for autos owned by the business. This insurance pays any costs to third parties resulting from bodily injury or property damage for which your business or employees are found legally liable, up to the policy limits. Depending on what kind of coverage you buy, the insurance may pay to repair or replace your vehicle because of damage resulting from accidents, theft, flooding, and other events. Workers Compensation Insurance or workers comp, as this coverage is commonly known, pays for medical care and replaces a portion of lost wages for an employee who is injured in the course of employment, regardless of who was at fault for the injury. It also helps protect the business from a lawsuit from the injured employee. Business Catastrophe Liability or Umbrella policies provide coverage over and above your other liability coverage limits. They are designed to protect against unusually high losses. For the typical business, the umbrella policy would provide protection over and above general liability and auto liability policies. Professional Liability Insurance policies are designed to meet specific needs of individual businesses specialized for liability policies needed by some businesses. They include Errors and Omissions Insurance (E&O)/Professional Liability Insurance, Employment Practices Liability Insurance (EPLI) and Directors and Officers Liability Insurance (D&O). Terrorism Insurance is offered to owners of commercial property as mandated by the Terrorism Risk Insurance Act, enacted by Congress in 2002. Insurance losses attributed to terrorist acts under these commercial policies are insured by private insurers and reinsured by the federal government. Navigating the world of commercial insurance and determining your businesses’s needs can be tricky. Be sure that you engage a reliable insurance professional when the time comes to purchase or re-evaluate your commercial insurance policies. You can click here to start the process of a quick, free, easy quote from one of our specialists at CommercialInsurance.net, or call us at 1-877-907-5267. Life Insurance. Life insurance protects loved ones against your death, but it can also be used to benefit your business–or save–your business. If you have life insurance, the insurer pays a certain amount of money to a beneficiary upon your death. You pay a premium in exchange for the payment of benefits to the beneficiary. This type of insurance is very important because it allows for peace of mind both personally and professionally; having life insurance allows you to know that your loved ones or company will not be burdened financially upon your death. General Liability Insurance. Every business, even if home-based, needs to have liability insurance. The policy provides legal defense and settlements or awards of damages if you, your employees or your products or services cause or are alleged to have caused bodily injury or damage to a third party. Property Insurance. If you own your building or lease space, or if you store business property at your home including office equipment, computers, inventory or tools, you should consider purchasing a policy that will protect you in case of fire, vandalism, theft, smoke damage etc. You may also want to consider business interruption/loss of earning insurance as part of the policy to protect your earnings if the business is unable to operate–if income is hindered, you still have to pay your obligations, and these coverages can help you do that. Commercial Auto Insurance. Commercial auto insurance protects company owned vehicles that carry employees, company products or equipment. With commercial auto insurance you can insure your work cars, SUVs, vans and trucks from damage and collisions. If you do not have company vehicles, but employees drive their own cars on company business you should have non-owned auto liability to protect the company in case the employee does not have insurance or has inadequate coverage. Many times the non-owned can be added to a Business Owner’s Policy which combines general liability and property insurance. Homeowners and Personal Auto Insurance. As your business grows, your personal assets do as well, generally speaking. Don’t neglect your personal insurance needs; increase your coverage limits as your assets grow. Umbrella Insurance. You may want some additional coverage, on top of insurance policies you already have. This is where an umbrella policy comes into play. This type of insurance is an extension to an already existing insurance policy and covers beyond the regular policy. This insurance can cover different kinds of claims, including homeowner’s or auto insurance. Generally, it is sold in increments of $1 million and is used only when liability on other policies has been exhausted. Any business owner should consider this policy to protect their hard earned personal assets. Nothing can replace speaking with a knowledgeable insurance professional about the types of commercial insurance policies, and determining what your business needs now, and in the future as it grows. Click here to start the process of a free, quick, competitive quote for your business insurance, or call 1-877-907-5267 to speak with one of our specialists today. Employee benefits are not the same as employee insurance or workers’ compensation insurance. Let’s look at the differences between the two. While employee benefits differ from employee insurance, or workers compensation, many times your commercial insurance agent provides both insurance and employee benefits to your business. Employee benefits generally start with health insurance and group term life insurance. With the ongoing changes of the Affordable Care Act — frequently called “Obamacare” — make sure you work with your agent to understand your responsibility. As part of the health insurance package, an employer may opt to provide vision and dental insurance. In addition to life insurance, an employer may also offer group disability insurance. A retirement plan is generally offered as an employee benefit as well. Unlike workers compensation insurance which is required by most states, employee benefit packages are provided at the discretion of the employer and may be funded with a variety of options. Generally, employers can provide these additional benefits to just the employee or also opt to cover family of the employees as well. Cost is almost always the determining factor in putting together an employee benefits package. With the cost of health insurance, it is reasonable to ask the employee to pay a percentage of the coverage, and perhaps even all of the family coverage. Workers compensation insurance is business insurance which will provide wage replacement and medical coverage for an employee injured on the job. Once you hire an employee a prudent business owner will consider worker’s compensation insurance. Varying by state, this coverage is mandatory depending on different variables. Ask your commercial agent the requirements in your state. As your business grows, an employee benefits package may be necessary to attract and retain good employees. Work with your commercial broker to develop and implement an employee benefits package that makes sense for your business. As a new entrepreneur starting a business, there are lots of questions to be considered. Make sure you have questions regarding the type of business insurance coverage your business requires. Commercial business insurance covers a broad spectrum of protection that includes your property, you and your employees, and your liability. As you begin to understand how it works, it is important to remember the ultimate goal is to make sure you are never underinsured or exposed to risk in the event of an incident or disaster. Business property insurance will cover losses to your building, and the property housed in it. The computer and phone systems, furniture, finished goods, as well as carpeting, lighting fixtures and supplies will be covered. There are two options, either actual cash value, which is purchase price less depreciation, or the replacement cost of the item. Discuss these differences in more detail with your commercial agent and look for the solution which is best for you. Most businesses are required to have workers compensation insurance when they have employees. Workers compensation covers the employee from lost wages and medical if job related while protecting the business against being sued by the employee. More specific information is available from the insurance department of your state government and your commercial agent. General business liability insurance must also be in place to protect the business, employees and the owner against lawsuits brought from claims of injury or damages. A general liability policy will cover most situations that may arise. There are specific types of liability coverage for risks not covered within the general liability policy. An example would be liquor liability insurance which is a separate coverage generally taken out by bars and restaurants. Discuss with your commercial insurance agent what else you should be looking at for in specialized coverage. A commercial auto insurance policy for a company vehicle or fleet insurance (for several vehicles) needs to be tailored to your business. Any vehicle owned or operated by the business may put the business at serious risk financially in the event of an accident caused by that vehicle or the operator. Most business owners know the risk involved with their product and service offerings but often assume their auto coverage is sufficient. Often, one of the first perks a business owner takes is having the business pay for an automobile. That’s a great way to enjoy your financial success…but don’t jeopardize that perk by insufficiently insuring it. Commercial auto insurance needs to be take out anytime the vehicle is titled to the business. It doesn’t matter the size, make or even if it is used strictly for pleasure. The business name on the title brings the business into a lawsuit in the event of an accident or personal injury. While the car may be used by the business owner’s spouse or family member exclusively, the titleholder (The Business) can be sued. Make sure you work with your insurance professional on the liability limits covered by the policy. Taking out just the state-mandated minimums in insurance may expose your business to financial risk in the event of a lawsuit or judgment higher than that amount. Opposition attorneys review assets in addition to coverage. You may wish to have your corporate attorney review the coverage and potential for risk as well. Vehicle classification, motor size, use, must all be noted and will impact both premium and coverage options. Your insurance professional can work with you in determining the proper coverage and policy. It may make sense to opt for fleet insurance for your business if you have more than one vehicle. Your agent can discuss those options. You commercial agent can review other coverages available for commercial auto insurance. Comprehensive coverage, under-insured motorist, medical payments and others may be available. Design a policy and coverage with your agent that provides adequate protection and minimizes the exposure and risk for your small business. Don’t assume you have good coverage without having a conversation and review with your commercial agent. Click here to start the process of getting a quick, free, competitive quote from us at CommercialInsurance.net, or call one of our specialists now at 1-877-907-5267. If I hire out of state employees, are they covered by my business insurance? This issue is extremely complicated and cannot be fully answered with a definitive yes or no in this article. It’s important to have a discussion with your commercial insurance broker prior to hiring an out of state employee. We discuss a variety of topics, but talk to your broker. Since you have employees, workers compensation insurance is a good place to start. If your business requires out of state travel and work, it’s important to talk with your licensed agent and carrier. Some policies and carriers have reciprocal coverage. However, some states may require you to secure worker’s compensation coverage in their state. In the event your employee resides and works in that state on a regular basis, you probably need to purchase coverage for that state. Anytime you are sending an employee(s) to work in a state for the first time, we suggest contacting the regulatory agency in that state as well as your agent or broker. If that state doesn’t recognize your coverage, you may be held responsible for all claim costs and penalties. At the time of this writing, four states do not recognize private coverage for worker’s compensation. Those states are; North Dakota, Ohio, Washington and Wyoming. In the event your sending employees to any of those states, make sure to contact the regulatory agency far in advance to insure coverage is in place. You may have an employee working in a multiple state area. Determining the correct state of jurisdiction may not be clear or easy. Contact your agent, your carrier, and all state agencies to determine how to insure coverage. Remember, the ultimate responsibility lays with you the employer to be compliant in the worker’s compensation coverage of its employees. Once you determine the worker’s compensation coverage, determine the liability and property coverage in your package. Make sure there are no exclusions and discuss in detail with your licensed insurance professional the scope of work outside your state. It’s possible you will need different vehicle insurance and coverage if you are providing a vehicle. Are you warehousing product or equipment at the employee’s home or commercial location? Again, your commercial insurance broker is probably licensed or affiliated with carriers in these areas. Make sure you have discussion and understand the coverage as you grow with out of state employees. No matter your profession or industry, every business needs insurance of some kind. Whether it’s workers compensation or vehicle insurance, each business wants to have their bases covered. Errors and omissions insurance (E&O) should be a part of any business that provides a service to clients for a fee. Not investing in E&O insurance is a great financial risk for many businesses as you leave the company vulnerable to lawsuits. Errors and omissions covers you or your business in the event that a client holds you responsible for a service you provided, or failed to provide, that did not have the expected or promised results. You, or your business, need coverage if you provide business services, such as consultations, to clients for a fee. Everyone and every business make mistakes and it’s important to be covered in the event a mistake occurs. If your client experiences a loss in customers, profits, or something else they deem valuable, your company could be in harm’s way if you don’t have E&O insurance. Your liability insurance often doesn’t cover the types of losses that errors and omissions insurance will. Look into your liability policy and gage whether or not your company is at risk without the addition of E&O insurance. As with any form of insurance, the best time to buy is before any potential risk takes place. If your business is in the service industry, investing in an E&O policy will not only reduce the risk your business takes, but it reduces the risk for clients. Having E&O as a part of your insurance portfolio could be a selling point as clients understand they could be compensated in the event of a loss. Make sure you look to errors and omissions right away and before any potential mistakes can take place. It is better to be safe than sorry. If you’re unsure about your level of risk, consult with E&O insurance professionals to see where the risks may lie. Where Can I Buy E&O? Buying E&O requires time and research. You’ll need to understand exactly where you, or your company, are at risk before buying a plan. Look for an insurance provider that understands your industry, your risks and can help you develop a plan that covers potential exposures. Different information may be needed depending upon the type of exposures you, or your business, could encounter. As with any form of insurance make sure to shop around to find the best pricing and coverage available. Keep in mind that the cost of E&O insurance may vary greatly depending on the class of your business, the location, and claims experience. Errors and omissions insurance is a necessity for a number of consulting and service professionals. Not only will you be able to handle claims from disgruntled clients better, you reduce the risk and exposures that come with running a service-based business. E&O insurance can help cover legal costs and secure the efforts of your business. Author Bio: Erica Bell is a small business writer who focuses on topics such as small business insurance and business liability insurance. She is a web content writer for Business.com.